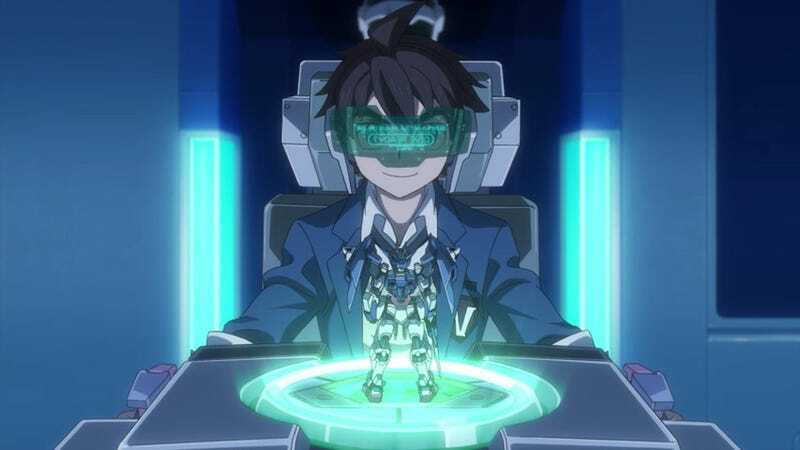 Previously I wrote an article detailing how I felt that the anime, Gundam Build Divers, featured a more realistic take on gunpla battling than its predecessors. Rather than using a machine that could bring plastic models to life complete with show accurate special FX and sounds, they use a machine not unlike the Gundam Pods in Japanese arcades. Except rather than a pod, it’s just a chair, a headset, and a device that scans whatever gunpla is placed onto it. This is just the basic model however, as a few episodes in we’re shown a different version of the system, one that comfortably fits at home in the form of a small pad to set the gunpla on to be scanned, a controller specially designed for the game, and of course the headset. I also said that I believed it was an idea that Bandai might actually turn into something. And now, it appears they’re doing just that. Known as the “Gunpla Battle Laboratory”, the device pictured allows users to scan gunpla into a virtual environment, fully detailed and functional. As you can see, the game they’re using as a demonstration for the scanning technology is fairly basic and low-rez from the looks of it, but as a proof of concept, it’s pretty damn cool. The next step would be making the scanning tech into a form more fitting in a persons home rather than something that looks like a miniaturized version of face scanning tech. I can’t picture that sitting on my desk. VR headsets already exist to give players the feeling of piloting their own gunpla from the inside rather than looking through a computer screen, and a custom controller would then have to be made. And then of course the game itself, which would likely be massive. At the end of the day, whether or not these experiments eventually become something real, it’s likely far off in the future. We’ll just have to wait and see if the ultimate Gundam game becomes a reality .